I too sold my gold cube and run the Multi Sluice now just because I dredge and the amount of super fines in my area is not that great, and I can get down to PURE GOLD in about 2 minutes with my Multi Sluice. However, the question keeps popping up. 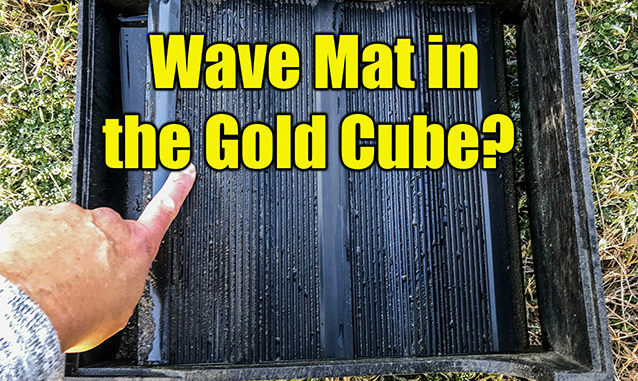 “Can I run GoldHog mats in the Gold Cube?” Today we decided to find out if the new Wave mat would benefit the GoldCube users at all. NOTE: Doc had already stripped one of the trays of the stock matting. He made a mat to fit with side tape and then taped the top edge to give a smoother flow from the well. The Gold Cube’s primary function is two fold. First it will super concentrate your concentrates and do a great job. Next, a lot of people use it when running black beach sands in Michigan, Washington, and Alaska. 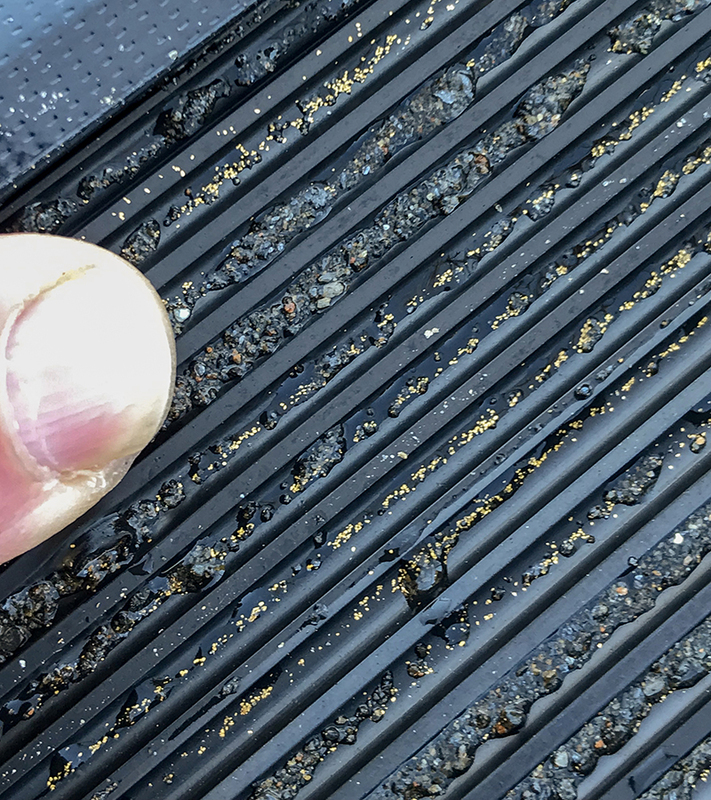 Lately many have started putting a stream sluice lined with our washer mat or MotherLode mat as a secondary sluice system after the Gold Cube, catching the tailings and running them. This DOUBLE RUN system allows for higher volumes and feed rates. In my opinion and experience running one, it does struggle a bit with RAW pay like we have in the south east. The vortex / conveyor matting used plugs up with clay and vegetation. It also does the same on LONG runs as a primary prospecting unit. So that is where we thought the Wave Mat might be helpful. The Gold Cube’s flow is fairly low. It uses an 1100 gph pump that lifts up high, and spreads out over 12″. So the water is maybe 1/4″ deep running of the mats. Not enough for most of our matting. However today we ran the Wave Mat in the second tray and we were very pleased with the exchange action. Doc thinks the Gold Cube really is efficient enough to leave as is… with the exception of those using it as a primary unit. They may benefit from the Wave Mat in the second or third tray just to give the slurry “something different” to run over. He feels that the Wave mat will not be as impacted by clays, vegetation, and impaction of heavies. Running it on the second tray, Doc felt it gave the slurry an exposure to SOMETHING ELSE other than just the same matting over and over and over. He said maybe run it in the third tray. The mat was REALLY open and fairly clean. It also held much fewer cons than the vortex mat. The results were almost exactly what Doc expected. Tray #1 held most of the gold. About 70%. Tray #2 about 20% and the last tray was about 10%. Again, he didn’t think there was much of a difference EXCEPT for the fact that the Wave Mat stayed VERY open ready for more exchanging than the vortex. 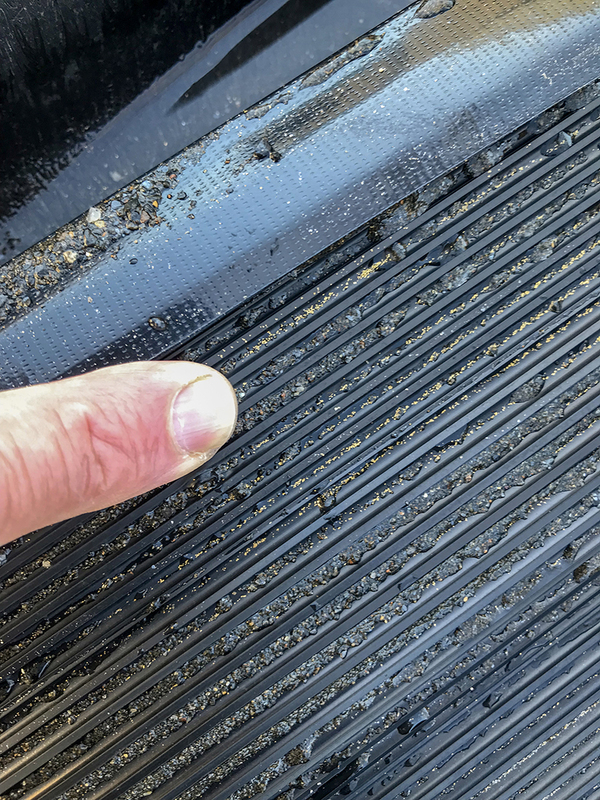 Be careful cutting mats…. 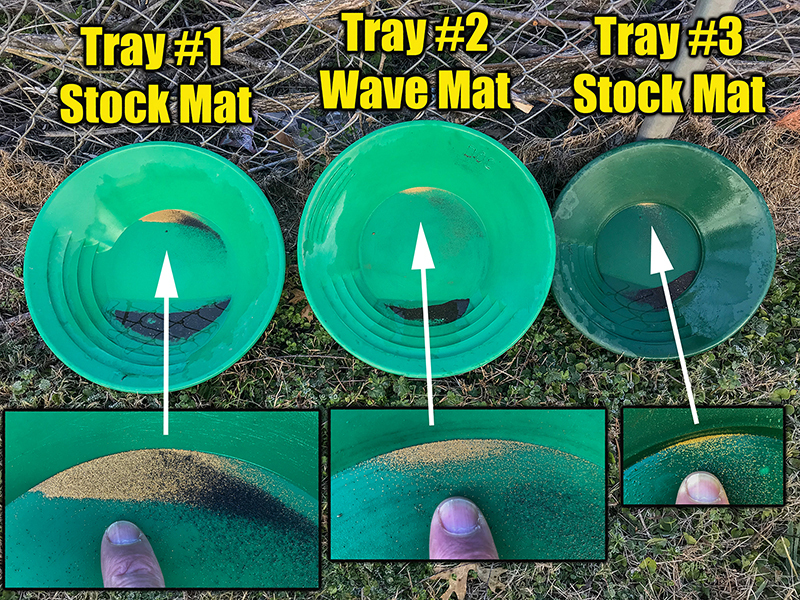 the trays are not exactly the same size. It’s worth doing some more experimenting to see what happens under different conditions. For MOST people I would leave the gold cube as is and if needed add our stream sluice to the end to run tailings with a special mat. More and more people running black beach sands are now running the gold cube with our matting at the end in a sluice. If you plan on running heavy clay material or raw pay dirt, it might be worth giving it a shot. Put some in the 3rd catch tray. 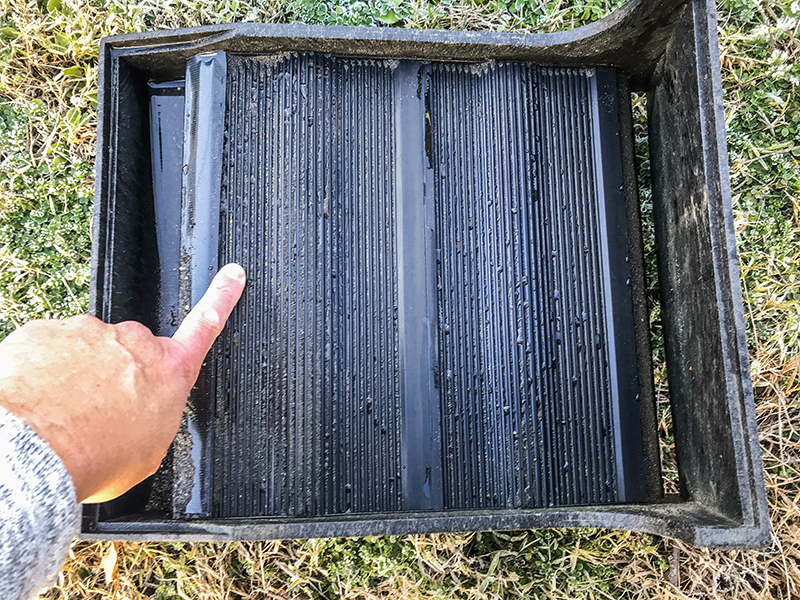 But again, don’t go out buying Wave mat thinking it’s some “miracle cure”… it’s just science. Below are the results. No we did not spend the time to weigh them exactly. No we did not test tailings. It was just a quick test to answer questions.